First I would like to say thank you for good wishes about my mum. She's still with us, although as I left the hospital last Tuesday evening, I would not have been surprised to have a nurse run after me to call me back. She was very ill indeed. However, she made an amazing recovery from the pneumonia, although the stroke is still affecting her movement of the right arm and hand. She's very hard to get out of bed and needs two or three nurses to get her into the chair by her bed. Early on Friday morning she was moved to Wynwood Nursing home at Mt Wilga at Hornsby, for Sydney readers. It's a high dependency unit on the first floor of the original Mt Wilga rehab and brain injury hospital. The whole nursing home is very small, just this one floor. Out the back is a very posh looking new private hospital. She has a lovely single room and the staff seem very pleasant. She looks over bushland towards Galston Gorge. Ironically, I have often walked past this building. Son and DIL with whom I now live, had a lovely house diagonally behind the hospital some years ago. The easy way to the bus was up their steep backyard, through the bush for a few hundred yards and then round the edge of the rifle range where the new private hospital now is. This was the alternate route to a good 15 minutes walk up a particularly steep hill. So knitting? 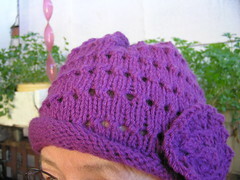 I have a finished pair of footies but no photo. The first one is here at Southern Summer of Socks. They are part of a belated birthday present for my sister. I wrapped everything up before I realiesd I had not taken a photo. The longer sock shown in that photo has an almost finished mate and there is also a small pair of Opal children's sock for Winterwarm almost finished. 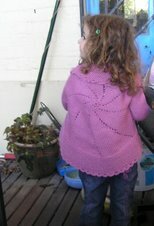 I've been busy also with a lacy jumper in Jet for Bell's Summer of Lace. I think this will be a bit small for me. I'm in between sizes given, and have adjusted my needle size several times and done proper swatches. However, I bought three lots of wool at Tapestry Craft's sale and one was always earmarked as a January birthday present for another DIL. If I'm not satisfied with this one on me, I'll give it to her. It's a colour she loves. Then I'll do some more swatching. I went to TC on Sunday 19th October - it was mad! Good plan for the lacy jumper if it doesn't fit!